The Canadian born singer songwriter Mac DeMarco with his almost trademark jangle pop sound has been a easy listen for many, especially with his first two albums and latest EP. He suggested different methods with ‘Chamber of Reflection’ for example, but not a change is tone for he endeavoured to maintain his lax and chilled out sound. 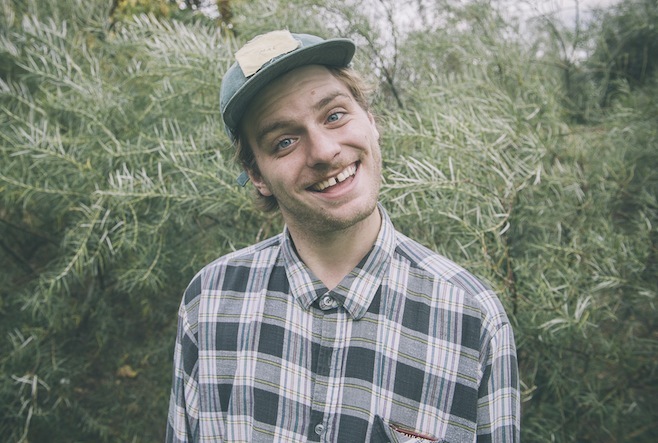 With his third studio album as Mac DeMarco, he is looking to go for a similar shift. With This Old Dog out on May 5th, Mac talked of using a purer acoustic sound but with synth and drum machine additions. This is certainly a shift that could prove interesting and yield results, but many factors could trip up even the most established of acts. Of the two singles he released this week, the title track is true to the purest sense of an acoustic style and though not identical to his jangling style, there isn’t a huge divergence between the two sounds. It still recounts his strengths of loose delivery and intimate vocals, but other than a light warping guitar in the background, there isn’t a huge amount to delve into here. ‘My Old Man’ is more representative of what he was suggesting with soft electronic beats woven throughout the song with an oscillating acoustic riff. It is all a subtle shift and this is perhaps dictated by his unchanged tone which perhaps stifles any major difference. Having said that he has enhanced the peculiar nature of these tracks and this includes the lyrics that operate between the eccentric and personally familiar. It’ll take a full album to place his changes accurately as there’s no definitive answer here. The title track features warped, drenched synths, nudging organs and feathered percussion that all deliver the hazy and laid back feel synonymous with the Canadian. His earthy yet wistful vocals echo back into the instrumentation to only add to the hazy feel and it will be a perfect track for lazy summer days and seems happily familiar territory for Mac DeMarco. ‘I’ve Been Waiting For Her’ and continues in a similar direction to his other singles with sprung riffs and a rotating rhythm with Mac’s zany and off-centre vocals and backing vocals gently nudging themselves to the forefront of the song. It’s a song to undoubtedly appeal to anyone who enjoyed Salad Days and there isn’t much scope beyond that. It still demonstrates the small intricacies of Mac DeMarco though. ‘The Way You’d Love Her’ is centred around the bending, wiry riff that Mac DeMarco has almost made his own. From this he generates a slowly meandering rhythm and melody with which Mac’s lyrics are fitted between each twinge of guitar as his slightly washed out vocals smooth out the melodic curves of the track. ‘A Heart Like Hers’ progresses and moves via and warped, dragging synth accentuated by that wiry riff to direct the song through it’s course. From this musical base echoes Mac’s ghostly, faded vocals and a repetitive vocal. A song for zoning out to but not much more. Despite the album having a very similar base of instrumentation, ‘No Other Heart features a more delicate rhythms wrapped around a more prominent bass-line and basic, yet quirky lyrical developments. Tracks like ‘Just To Put Me Down’ and ‘Without You’ are tracks that are evocative of most of the tracks on this album and you become a little tiresome of that wiry riff with these songs and you have to be in a particular idle mood to enjoy most of this album for what it’s worth. The album is still a more than decent effort, just nothing you haven’t heard before. Fans of Salad Days will enjoy this. A consummate professional in the field of madness and being laid back, Mac DeMarco releases another track from his upcoming mini-LP Another One which is out on August 7th. The new track is ‘I’ve Been Waiting For Her’ and continues in a similar direction to his other singles with sprung riffs and a rotating rhythm with Mac’s zany and off-centre vocals and backing vocals gently nudging themselves to the forefront of the song. It’s a song to undoubtedly appeal to anyone who enjoyed Salad Days and there isn’t much scope beyond that, which is perhaps why it is being understated as a ‘mini’ LP. Either way you can still enjoy the quirks and little eccentricities of Mac DeMarco with this track. The enigmatic Mac DeMarco recently released another track off his upcoming mini-LP Another One that’s expected on August 7th. It was the turn of the title track this time and it’s very much in a similar vain of the previous single and not too far from the his Salad Days album. It’s warped, drenched synths, nudging organs and feathered percussion all deliver that hazy and laid back feel synonymous with the Canadian. His earthy yet wistful vocals echo back into the instrumentation to only add to the hazy feel and it will be a perfect track for lazy summer days and seems happily familiar territory for Mac DeMarco. The Brooklyn based duo of Molly Hamilton and Robert Earl Thomas make up Widowspeak; a hazy, shoegazing band lead by the soft tones of Hamilton and the lapping guitars of Thomas. They have recently announced the release of their third studio album titled All Yours for a September 4th release and two tracks from the upcoming album as well. The title track is steady with a subtle groove much like the style of Mac DeMarco of recent times, but with this are soft-edged ringing guitars and of course Molly’s soothing vocals to make for a calm and wonderfully idling track. ‘Girls’ carries on this theme with more prominent percussion and a rolling bass-line and a wiry guitar solo. This ushers in a growing and living sound which ever so subtly nudges it’s way up a notch with control and discipline. Another easy listening track to kick-back too and two tracks to make up the soundtrack to your summer.